Kent C. Behrens’ photographic art has been recognized for over two decades in many U.S. exhibitions and publications. His focus extends from plants and animals to architectural imagery and visual abstraction, sometimes incorporating unconventional processes such as Polaroid image transfers and emulsion lifts. Mr. Behrens’ work appears in museum, corporate, and private collections, botanical center exhibits, and in such venues as The Sun, a U.S. journal of contemporary photography, literature, and essays. Though long devoted to traditional silver print photography and process, he has recently explored digital realms. Born into a Chicago family of informal painters and photographers, he has served as a college faculty member, an urban planner, and graphic designer. He lives in Omaha, Nebraska, U.S.A.
Mr. Behrens’ art, whatever its photographic technique, often features plant life in considering the antithesis between rootedness and outward force. He also seeks to navigate the parallel tension between continuity and digression, a dynamic observable in most growth patterns, including human ideation. Hence the title for this sequence of images. Notably, from his earliest work, he has been intrigued how figures in classical Chinese and Japanese calligraphy may be felt before being understood. 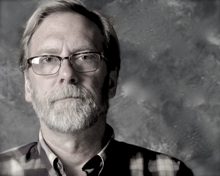 Share the post "Kent Behrens: Stem and Digression"